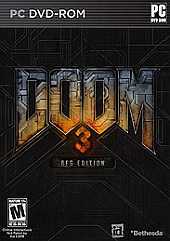 The BFG Edition will include the original game, the 2004-era "Doom 3" with enhanced graphics, the add-on "Doom 3: Resurrection of Evil," a checkpoint save system, and copies of "Doom" and "Doom II: Hell on Earth." It will also feature a new, armor-mounted flashlight, allowing players to illuminate dark corners and blast enemies at the same time. It also has hours of new content, including a seven-level solo section called, "The Lost Mission," which was cut from the original release of Doom 3. The new missions take place in Hell, where you shoot rockets and plasma pulses at screaming, charging demons as they attack wave after wave and you circle-strafe and hunt down health packs and armor to survive. The whole world's a little bit brighter. They upped the player speed, upped the ammo counts, and just by doing those small things have pushed it more towards horror-action instead of horror-survival. New support for 3D TVs, monitors, and head mounted displays also allows players to experience the game with more depth than ever before.